I had never tried this recipe and was so glad when I did. Not sure where I got this one but it sure is tasty! I had to stop myself before I ate them all. If I had used them with butter cream I would have been in T-R-O-U-B-L-E. They are soft but crispy too. My husband likes sanding sugar on them and that is how I made these. I will make them again with royal and butter cream icing for gift baskets. Here is the recipe. You better try it sooner than I did. Preheat oven to 350’. Beat cream cheese, butter, sugar and vanilla in bowl and mix until creamy. I use my Kitchen Aid because it is easier and faster for me. Add flour and soda mix well. Cover and place in fridge for 1 hour. Roll dough ¼ inch thick. Cut into desired shapes. Bake for 10-12 minutes or until golden brown. They will be soft and crisp up as they cool, so don’t over bake. Ice with butter cream or royal icing. 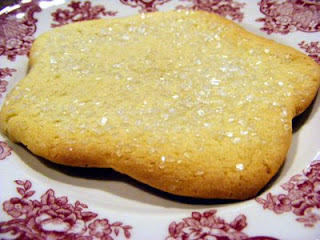 You can also sprinkle sugar on cut out shapes before baking. They are so good! Are these the cookies you made for the Fall Party? Levi let me have a bite of his last night and they were SO amazing, Stacey!! I want to try my hand at making these for Christmas-Katy has been after me for years to make sugar cookies and I have never liked any I tried, but we will definitely try your recipe! No, I made a different one. It will be posted soon. This one is really good too.